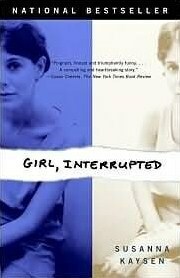 A memoir: In 1967, after a session with a psychiatrist she'd never seen before, eighteen year old Susanna Kaysen was put into a taxi and sent to McLean Hospital. She spent most of the next two years in the ward for teenage girls at a psychiatric hospital as renowned for it's famous clientele --Sylvia Plath, Robert Lowell, James Taylor, Ray Charles-- as for its progressive methods of treating those who can't afford its sanctuary. Why did I wait so long to read this? I adore the movie, so why oh why did I wait so freaking long to read the book? I finally checked this book out at the library when it was hugely recommended to me by a co-worker(who is awesomesauce BTW). She had completed it in a day, so needless to say, my expectations were high. This book FAR exceeded those said expectations. I devoured this book, completing it in 2 days(darn life for getting in the way!) This is one of the most beautiful, most raw novels I think I have ever read. There is no fluff, no beating around the bush. Susanna gives a very real and vivid peek inside those 2 years at McLean hospital and some of the treasured and troubled souls she befriended. You can't help but wonder "Where are they now?" A simple writing style that makes it feel as if Susanna is in the same room as you, retelling those acounts back in 1967, you can't help but be completely swallowed up by her stories. A truly remarkable novel that will have you laughing, crying and shaking your head in awe. I think this is a novel that should be read by every Young women out there. Yes, the content may be crude at times, but the book as a total package is indescribable! I read this book right after I saw the movie, but sadly I only remember that I liked the movie more. .. Maybe now that I'm older I should give it another chance! I've heard about this movie, but didn't ever know what it was about. It sounds fascinating! I just finished a book about a woman with MPD and 17 alters, so I'm all interested in psych books and issues now. I may have to check this one out!